That brought out all the usual comments against raising the minimum wage. I never seem to get comments from people who agree with me on this, only with people who disagree vehemently. However, all of that is beside the point. The point is this: McDonald’s is in business to make a profit. I’m okay with that. That’s never been in question. On the other side of the coin, the workers that McDonald’s has to have—or else the company can’t operate–are also in business to make a profit. I think everyone is okay with that. 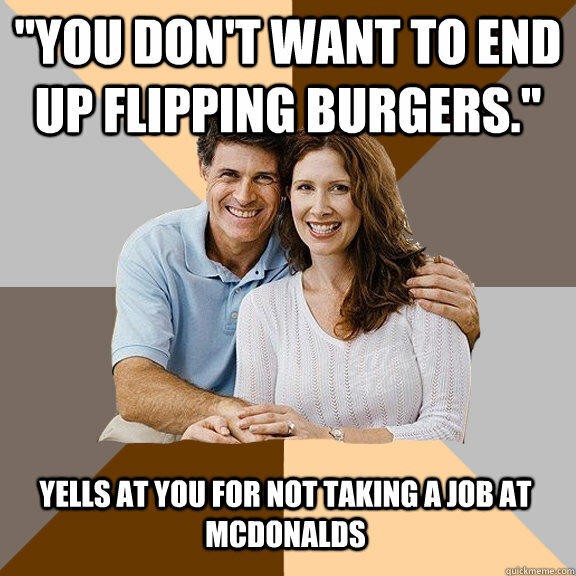 I say “I think” because there’s a lot of disparaging comments about low-wage workers whenever I post one of these memes, as if just because someone finds himself working in fast food, he unquestionably is an unskilled, uneducated, teenage chump who just needs to get some ambition and/or go back to school. So think on that for a moment. Do you find yourself in agreement with such sentiments? If so, why? Ask yourself why you think that the people who actually make—by hand—the product the giant corporation sells should be paid as little as possible while the profits of the corporation that employs these people should be as big as possible. The meme implies that McDonald’s had an annual profit of $8.5 billion. There does not appear to be a source for that figure, but it’s probably more or less correct, as here is information on McDonald’s gross profits (revenue minus cost of goods sold) for the 12 month period ending March 31, 2014: $10.93 billion. “Cost of goods sold” includes labor, i.e., the much-maligned “burger flipper.” So there’s still quite a healthy profit after paying the burger flippers–almost $11 billion. “[The effective state subsidy] comes to an average of $7 billion a year. That’s the amount of annual public assistance families of fast-food workers received between 2007 and 2011, according to a new report written by economist Sylvia Allegretto and others, sponsored by the University of California at Berkeley’s Labor Center and the University of Illinois at Urbana-Champaign, and funded by Fast Food Forward, the group that helped organize the summer’s labor strikes. The authors used publicly available data. What if we…gulp…”redistributed” some of McDonald’s profits? And now we start to see the obscenity of McDonald’s “profit.” That $7 billion subsidy cannot be attributed totally to McDonald’s of course, as there are many other fast food establishments. 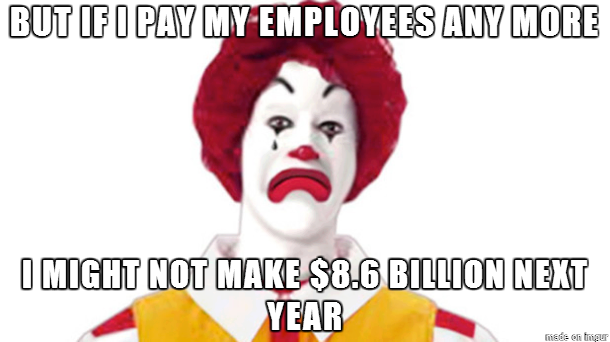 Let’s assume that McDonald’s is only responsible for $1 billion of that $7 billion. And then let’s say that McDonald’s was forced to divide up the $1 billion equally among all its minimum-wage employees in exchange for being able to get those employees off welfare. And, let’s say we take that $1 billion in a lump sum out of the nearly $11 billion gross profit we mentioned above. In other words, we—gasp!–redistributed McDonald’s profit (except it’s not really redistribution, because that money should have gone to the workers in the first place)! Suddenly McDonald’s doesn’t have $11 billion anymore, it only has—horrors!–$10 billion. How can the company possibly survive? 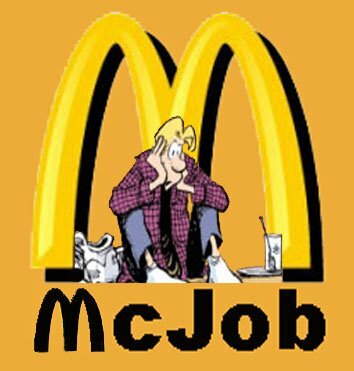 “ Amid a movement of fast-food workers pressing for a higher minimum wage, a financial planning guide for McDonald’s workers has landed with a thud. Suggested monthly expenses include $20 for health care; $600 for rent; and $150 payment for a car (that apparently needs no gas.) Unfortunately the budget doesn’t have an allowance for food. ‘It doesn’t speak to the realities of low-wage workers in the food industry,’ said Teo Reyes, the program director for Restaurant Opportunities Centers United, a nonprofit that seeks to improving working conditions for restaurant workers. See what an easy solution? Make McDonald’s profit slightly less obscene but still quite healthy, pay workers more, relieve the state (read—you and me) of the burden of workers on welfare, McDonald’s gets to be the good guy, prices at the restaurant don’t have to increase. What, other than McDonald’s makes slightly less and its employees make slightly more, could possibly be the problem with this? Exactly—there is no problem except the shrieking heads who love redistribution from the bottom to the top but think it’s immoral for redistribution to go the other way (see the Stanley Druckenmiller video here if you doubt that the true redistribution happening is from the bottom to the top). We have been taught that to practice “capitalism,” we can never make enough money and that profits have to always increase, no matter what undesirable actions it takes to increase those profits, whether it’s paying workers as little as possible, laying off workers, raising prices, moving jobs overseas, diluting the quality of the products, etc. That’s not an economy, that’s a psychological disorder. It’s crap-italism. This entry was posted in "supply and demand", Crap-italism, minimum wage, Reverse socialism, Wage slavery, Wages, Wealth transfer and tagged cost of goods sold, crap-italism, gross profits, McDonald's, obscenity, profits, redistribution, Stanley Druckenmiller, state subsidy, wages, welfare. Bookmark the permalink.